In all kinds of business operations, it’s normal to handle a lot of things—sales, marketing, partnerships, content and communications, product creation, service support, administrative work, and so much more! Despite the enormous load we have to manage, we still really want to get things done right away as efficiently as possible. However, sometimes our workers may have a little bit of a hard time understanding things, managing the work, and, overall, getting things done. Because of this, different concepts have been created to organise better the different sectors necessary for a business to run. Two of these important concepts are the idea of systems and the handling of tasks through project management. Aren’t the two just the same? First things first: no, the two are not the same. How do you do the task? When will I start doing it? It’s just as simple as that. These two questions already briefly explain the difference between systems and project management. Now to delve in deeper, let us elaborate on the two. Systems are used when you are trying to learn how to do something. Systems exist because they are the standard process of producing a uniformed output. The system will show the worker how things are supposed to be done. It simply answers the questions “how” because systems are meant to be a storage of information, techniques, or instructions you need to follow to produce the same kind of finished product. On the other hand, project management is a term coined to generalise a group of organised deadlines that have to be done to meet a specific goal or milestone. Project management is all about managing the tasks in an orderly fashion so that you will know “when” to do something and “when” it has to be finished. In the simplest sense, it is like a to-do list you have to manage or monitor to ensure the final product is done on time. Although the concepts are closely related, they do not mean the same thing. A lot of company workers get confused because they tend to mix the two concepts despite them being two separate elements from each other. 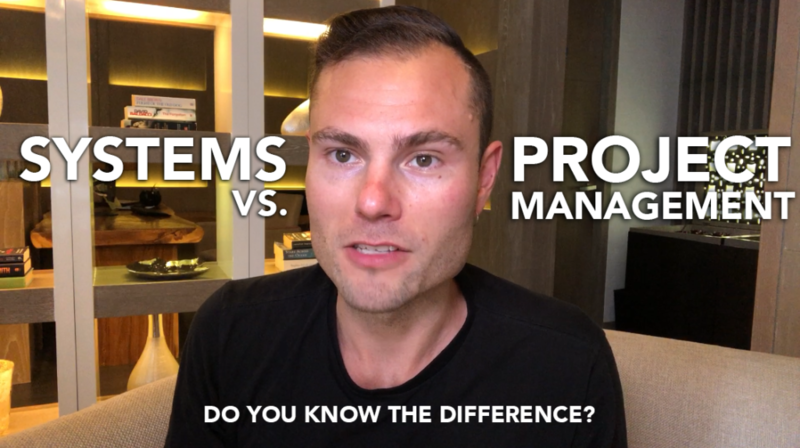 Knowing the difference between the two is very important because it will help you and your company become more organised and more systematic in dealing with different tasks and deadlines at hand. At the same time, you won’t have a hard time repeating instructions over and over again, creating chaos and disruption, so that you can teach new employees about the workflow in your office. But then again, so what? Now that I know the difference between the two, how can I be better at it? As time evolves, so does technology, and now that it is at its peak, it’s just right to utilise it and take good advantage of it all for the benefit of the company, yourself, and your workers! Now that the difference between the two concepts is much clearer to you, let me introduce a few life hacks on how you can better apply what you now know and practice having a systematic and organised workflow in the office. Are your new members having a hard time following systems and practising project management? Do you think they’re mixing and interchanging the two? Well, thanks to technology, we’ve got some pretty useful life hacks that can help you train your mentees, so you won’t have to micromanage them while doing your tasks as well, making it a win-win situation for everyone! One of the most well-known online presentation maker, Google Slides, powered by Google, can be a handy tool in creating your system’s processes. It is such a convenient visual aid creator, and you have the option to either make it editable by the public or for them to view it only. You can also share links to people and customise them however it suits the situation at hand. Google Slides can be helpful in systems storage, alongside its very user-friendly interface. Still making its way into the favourite side of the web, SystemHUB is software which caters to your business’ processes, procedures, documents, and other important files, so your members can view it easily, learn it themselves, and apply it in their work as well. With this handy software, you’ll never have to micromanage ever again. If you’re into cork boards and visual lists, then Trello’s the app for you! Trello has visual boards and chat options which make it easy to track specific projects and deadlines. You can even add people into individual cards and boards which will notify them whenever a deadline is near or has passed. With Trello, project management has never been this easy. Asana is also another project management software which helps project managers properly inform people of their tasks through features such as chat, team messaging, and performance reports all in one big chunk. With it being a perfectly productive work management platform, you can easily track daily tasks for you to grow your business and meet your goals as a team. Just like the other two, Wrike is a project management software which helps team leaders manage their members’ deadlines, tasks, and goals without the hassle of physical meetings every day. The software allows collaborations among members, project and schedule monitoring, and oversight of other important workflow processes to guarantee that you and your team are right on track. Aren’t those apps amazing? Real work–life hacks indeed! With just a few clicks, you’ll have trained members in no time! If you’re still having a hard time, you can always click on some tutorials on the websites or the software themselves or through different video websites. Through our unlimited access to technologies and apps, running a business won’t be that hard anymore. As a last piece of advice, learn how to utilise different resources so you can help your team be better. As long as you don’t go mixing up the two concepts, you and your business will thrive.